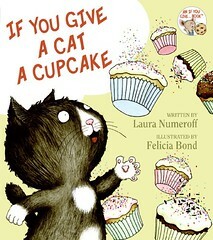 Today was the official release date of Laura Numeroff's kids' book If You Give a Cat a Cupcake. I predict we see even more kids-themed cupcake books, just as we are seeing more and more cupcake cookbooks. If you give an adorable gray kitten a supporting role in a popular series, he'll cry out for a lead—and thus, this latest entry from Numeroff and Bond, which features a cat that first appeared in If You Give a Pig a Party. Like its predecessors, the story bubbles with cascading “if... then” silliness: a girl's granting of a cupcake, for example, leads to a request for sprinkles, which causes a mess; cleaning up gets the cat overheated, which prompts a trip to the beach, and so forth. Some of the connections feel forced even for this series (a ride on a merry-go-round whale inspires a wish to go to a science museum), but the vivacity of the drawings and pertness of the kitty protagonist make up for the shortcomings. Besides, a lot of the series' appeal can be credited to the competency and ingenuity of the various human enablers in the books. While sometimes baffled by the goings-on, the girl in these pages is able to roll with the punches—unlike many adults. is she coming to L.A.?